This post is your Toyota forklift serial number guide. It will be useful to you if you have purchased a used Toyota forklift, but don’t know the model number or year of manufacture. Without this info, it will be tough to repair or maintain your Toyota forklift because you’ll need a repair, parts or operators manual. To get a Toyota forklift manual (or any brand of lift truck manual, for that matter), you’ll need model and serial number information to locate the right technical publication. This handy article will show you how to find that information for a Toyota forklift truck. Specifically, we’ll show you how to locate the serial number of the forklift which unlocks access to all the information you’ll need to keep your forklift running, as well as the year of manufacture. What is my Toyota forklift’s serial number? The easiest method to find the serial number of a Toyota forklift is to check the name plate (sometimes called a forklift data tag or info plate). This metal plate provides key information that you’ll need about your forklift. The nameplate on a Toyota lift truck looks like the picture on the right. It is typically found somewhere near the forklift dashboard. Locating and reading the data plate is the best way to find a forklift serial number. However, on older lift trucks, the name plate may have rusted out, been worn down or damaged so badly that it cannot be read. If so, you can still find the truck’s serial number. It is often stamped on the frame of the truck. 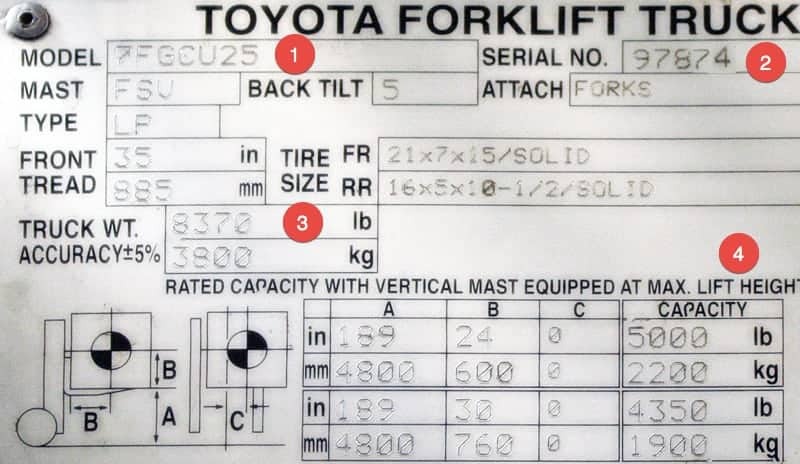 To figure out the year your Toyota forklift was manufactured, you’ll need to read the serial number and look for a letter in the last position. Note: The letters “I”, “O”, and “Q” are skipped. So, the process repeats beginning with A (1980) until Z (2002), currently in 2018 Hyster is manufacturing trucks with “S” as the last digit in the serial number. If your Hyster forklift was manufactured before 1957, to contact your local Hyster forklift dealer.